Bi-weekly Mortgage Calculator – How much will You Save? Biweekly Mortgage Calculator calculates many different payment frequencies: weekly (52 payments per year), bi-weekly (26 payments per year), semi-monthly (24 payments per year), monthly (12 payments per year), bi-monthly (6 payments per year), quarterly (4 payments per year), semi-annual (2 payments per year), and annually (1 payment per year). See how paying at varying frequencies affects your principal mortgage balance. 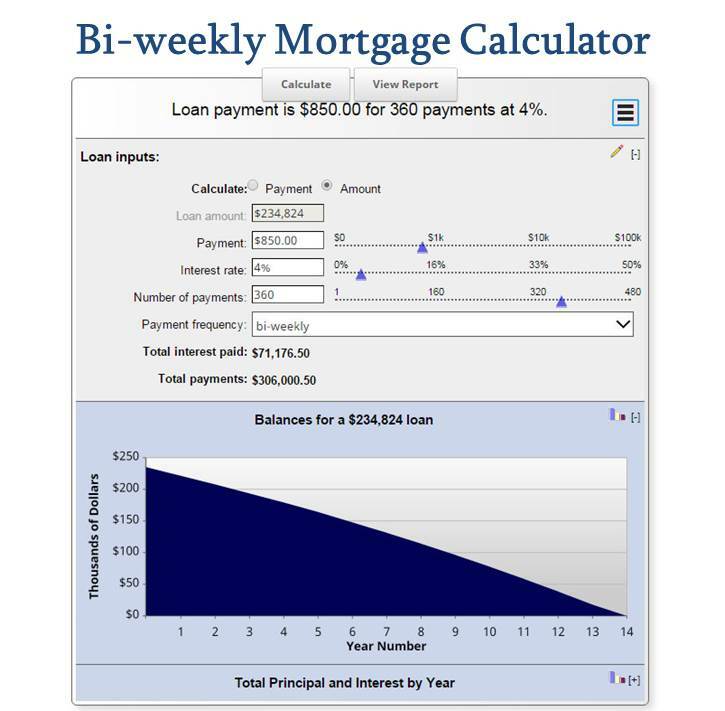 Calculate how many bi-weekly mortgage payments must be made before your loan is paid off. See how much faster your loan could be paid off with a biweekly mortgage. Looking for a different calculator? More Mortgage Calculators Here. You can examine your principal balances by payment, total of all payments made, and total interest paid. You may also email the results by clicking on the three-line icon in the upper right hand corner of the mortgage calculator. *NOTE* This calculator doesn't figure principal prepayments. Trying to pay off mortgage early? You may also be interested in the Early Mortgage Payoff Calculator.